Media rooms are still a hot topic among homeowners, but local experts say more clients are including media room features in spaces once designated as living spaces or family rooms. 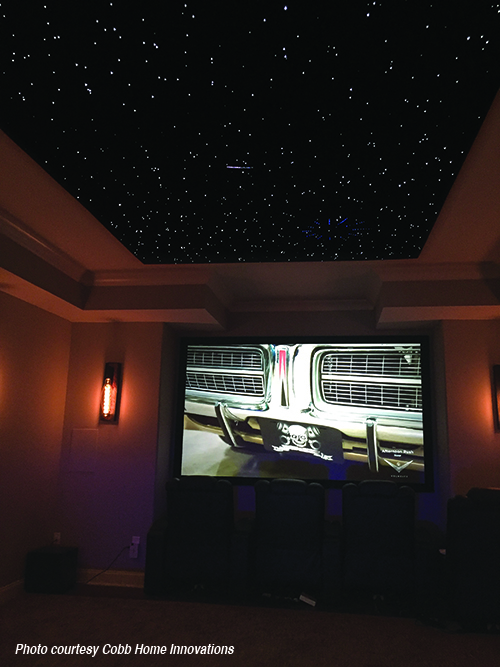 Although theater rooms were once the rage, homeowners are moving toward the use of multipurpose media room, according to Kimberly Kelly of K7 Interior Design. “Today’s media room functions much like the traditional family room, the difference being that most activities are filtered through technology. Media, home automation, web-based apps, and streaming media join to create today’s “smart home,” making infrastructure the backbone of the system,” she says. A great A/V company is worth its weight in gold, Kelly adds. Regarding client preferences, Fudim says that at the very least, some homeowners are looking for a big screen while others really need multiple screens to fit their lifestyle. “Technology has changed so much in recent years it is now easier than ever to stream programming and to install integrated sound systems that don’t break the bank,” she says. “Advances in streaming internet content have fueled the trend for multiple screens and the way the client uses the space dictates the screen layout in the media room, Kelly reports. Popular screen layouts include two or more large televisions mounted on the front facing wall, which works very well for sports fans who want to view multi-streamed events. Kelly says the other favored option is one large main viewing screen with additional smaller screens on adjacent walls. The smaller screens could be used for gaming, tablet, and smartphone powered social media and internet surfing. Pointing out that the smallest amount of light infiltration can compromise viewing quality when using screen and projector systems, Kelly says these systems have fallen out of favor.